Celebrity Chef Mark Brown has invested over 18years of his life in the culinary industry as an effective Ambassador for the flavor filled experiences that he has created for clients. Chef Mark de-mystifies and simplifies cooking, specializing in fusion cuisine. His travels as a Private Chef on The Chantell MaVie, a private yacht sailing to various islands such as Belize, Honduras, Guatemala, Punta Gorda and St. Vincent, provided him with the opportunity to personally experience a wide variety of culinary cultures that only enhanced his innovative style and creative prowess which has allowed him to capture a broad base of clientele over his many successful years. Armed in 1995 with an associate degree from the Art Institute of Atlanta, Chef Mark Brown swiftly gained the ranks as the Executive Chef at 201 Courtland , he journeyed to become the Corporate Executive Chef for Gourmet Services, Executive Chef at The Brownstone on Main in Columbus Ohio, as well as holding various chefs positions in numerous hotels such as the Hilton, Stouffers Center Plaza and The Four Seasons, where he did a two year internship under the tutelage of renowned Chef Darryl Evans. Chef Mark Brown’s American cultural diversity has given rise to a number of unique dishes that have gained him notoriety and opportunities to establish a list of renowned clients. He has displayed his talents as a Personal Chef for entire families, professional athletes, pastors, and dignitaries. As a Specialty Chef he has established his name accredited to various movies and television shows as well as events and other functions. . Chef Mark Brown’s culinary style is creative, charismatic and non-discriminating. 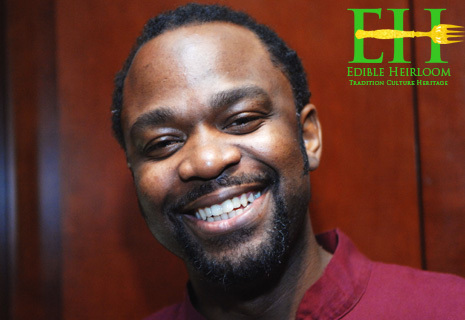 He combines the rich, bold, flavors of the Caribbean, the South, Creole, Southwest, and Soul in addition to Asian, French, and Vegan cuisines. His award winning dishes have been well received on the TBS sitcoms ‘Meet The Browns, and ‘House of Payne.’ Chef Mark Brown has graced the movie sets of ‘For Colored Girls’ and ‘A Family that Preys’. Chef Mark Brown is presently a freelancing Personal Chef and Operates an International Catering and Restaurant Consulting Business. Chef Mark Brown invites you on a culinary journey using his menu as the pass port, your palate as the vehicle and his magnificent food as the destination!